See the other running routes here. 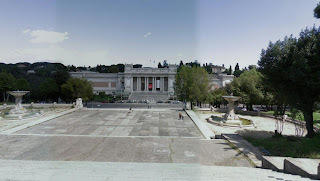 Pictures from Google StreetView. Thanks! If you're spending time in Rome, then chances are that you'll be doing a lot of walking to take in all the varied sights, spread all over the center of town: the Trevi Fountain, the Piazza Colonna, the Pantheon, the Vatican, the Forum, the Colosseum, etc., with all their tourist bustle. But, if you're like me, you'll be wanting to see something a bit greener and quieter when you run. 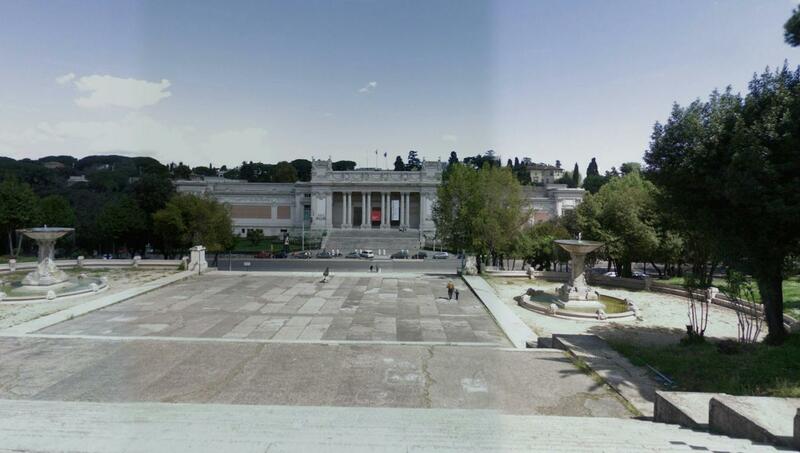 So here's a route that takes you through a pleasant park right in the center of Rome: the Villa Borghese Gardens. NOTE: For another route through quiet, green Roman streets, also see Rome, Classical Sights. Pincio hill, where the gardens are located, has been the home of gardens, in various forms, for thousands of years. Two thousand years ago, Lucullus built a fabulous Persian-style garden there with the spoils he'd dragged back from wars in the orient. The present garden was begun by Cardinal Scipione Borghese, and was later re-done in the English style, and is a great place to run. There are lawns, ponds, fountains, the Villa itself, museums, the city zoo, and great views towards the west. 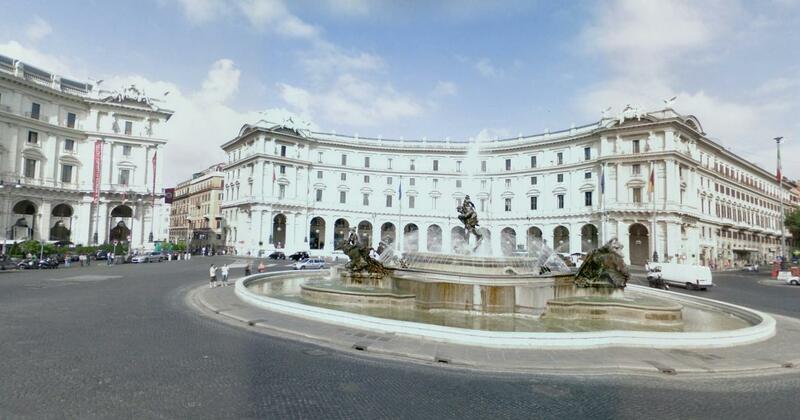 We'll start the run at a central spot: the Piazza della Repubblica, near the Termini train station. Repubblica, with its fountain full of frolicking sea gods and goddesses is located in front of the Santa Maria degli Angeli church, which is well worth going inside, when you're dressed for it. The church was designed by Michelangelo, placed inside the imposing ruins of the ancient Baths of Diocletian. It's a strange mixture, and worth your time! Looking at the church entrance, turn to your left (north) and run to the next corner, where you'll turn right and run down Via Cernaia, along more of the bath ruins. Turn left at the next intersection, on Via Pastrengo. Now you just keep running straight towards the park, even though the street curves left, then right, and changes its name to Via Salandra and then to Via Piamonte. 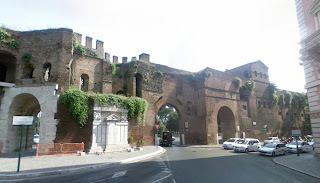 You will eventually come to the old Roman city walls, built by Aurelian in 271 to keep out the German tribes. Now the Germans come, like the other tourists, via the airport train. 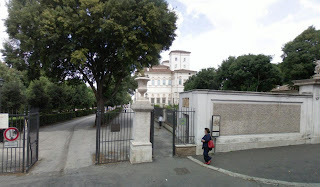 Simply run through the gate in the walls, cross the busy Corso d'Italia street directly behind the walls, and continue the last block to the Villa Borghese gardens. The street changes its name again here to Via Puccini. Puccini runs diagonally into Via Pinciana, where you continue running straight, with the park on the left. In just 100 meters, you'll see an entrance on the left, at the Viale dell'Uccelliera. Turn in here. You'll see the Villa itself straight ahead in the park, which is now a gallery of classical Italian art. We'll do a loop through the park, counter-clockwise. Run straight past the villa, then keep going straight through the formal gardens on your right side. When you get to the pavilions at the end of the formal gardens, turn right and run through the open lawn and then through the trees to the next clearing, with a tower-like pavilion in the middle. Turn left now, and run northwest 150 meters to the fenced-off zoo, where you turn left and run back towards the center of the park, with the zoo fence on your right side. The birds, monkeys and reptiles are located in the area along the fence, which you'll probably hear and smell. You'll cross the Viale dell'Uccelliera again, cutting across the grass straight ahead. At the first footpath, turn right and run as it curves to the left through a lawn. It will run straight to the Lago, a pond with its decorative Temple of Aesculapius. Run around to the other side of the pond, with the water on your right side. You'll run straight into another footpath, the Viale dell'Aranciera, where you turn right and run the 200 meters to a rise. There, to the right, you'll see the classical facade of the National Gallery of Modern Art. It's housed in a building which was once built for a world exposition. Continue following the footpath as it now circles towards the left and continues going southeast on the Viale Fiorello La Guardia. Keep going on this path until you come to the white marble statue of Goethe. Here, you turn right, to run towards the western park exit, along the Viale delle Magnolie. You'll run past an obelisk, where you go straight to the end of the park in 100 meters. There, at the parking lot, you'll turn left on Via Adamo Mieckiewicz. This street has a great view of the city towards the west. You can see over much of old Rome, across to St. Paul's in the Vatican and the gigantic white Vittorio Emanuele monument. Keep running straight down the street. At the Trinita dei Monte church, you'll see another obelisk, marking the top end of the Spanish Steps to your right, leading down to the Piazza di Spagna below. There's not much room to squeeze through all the tourist masses lounging about on the steps, so we'll keep going up here. Follow the Via Sistina from the church, as it leads southeast past the Barberini plaza, with its Triton fountain, and then on to Via Nazionale. 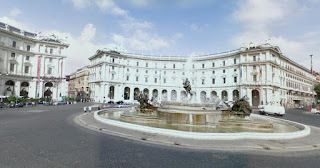 Here, you turn left and run the four blocks back to Piazza della Repubblica.